Today I’m teaming up with British fashion brand JD Williams to bring you my summer styling tips on how to keep cool and covered at the same time. I generally find summer really difficult to dress for. Mostly because I don’t always feel comfortable showing off too much of my flesh. Side note: this of course is a personal choice and it doesn’t mean I judge others that do love to show off their beautiful bodies. Plus with the UV rays being so strong at the moment (remember to check this as well when looking at the temperature!) I’ve been trying really hard to avoid damaging my skin by keeping covered up a little bit during peak sunshine times. JD Williams very kindly sent me this beautiful cobalt dress by Anthology. The length is perfect for summer. 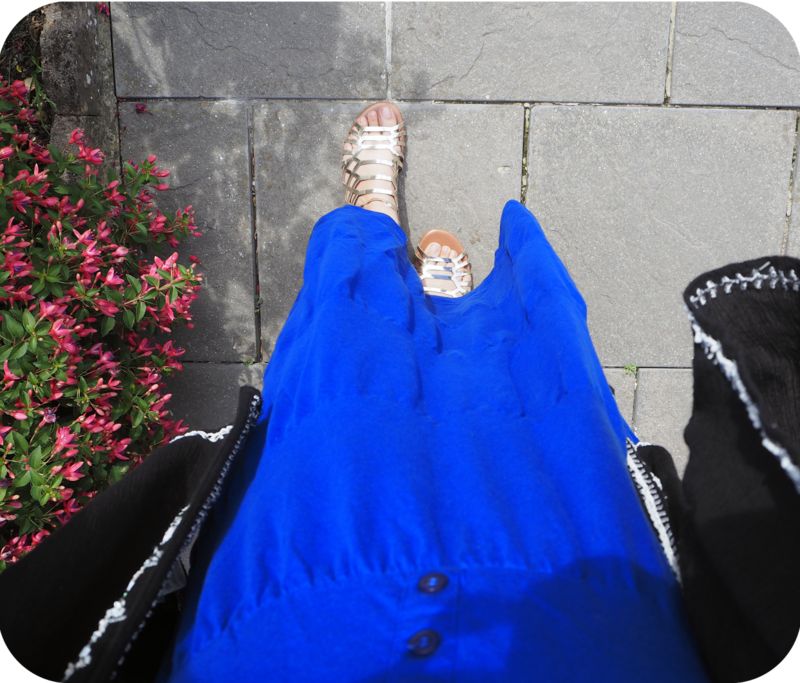 It’s not quite a floor length maxi nor is it a midi, what’s even better is that on the JD Williams’ website it lets you choose the dress in a number of different lengths. I didn’t want to show off my cankles too much so I opted for the longer version. 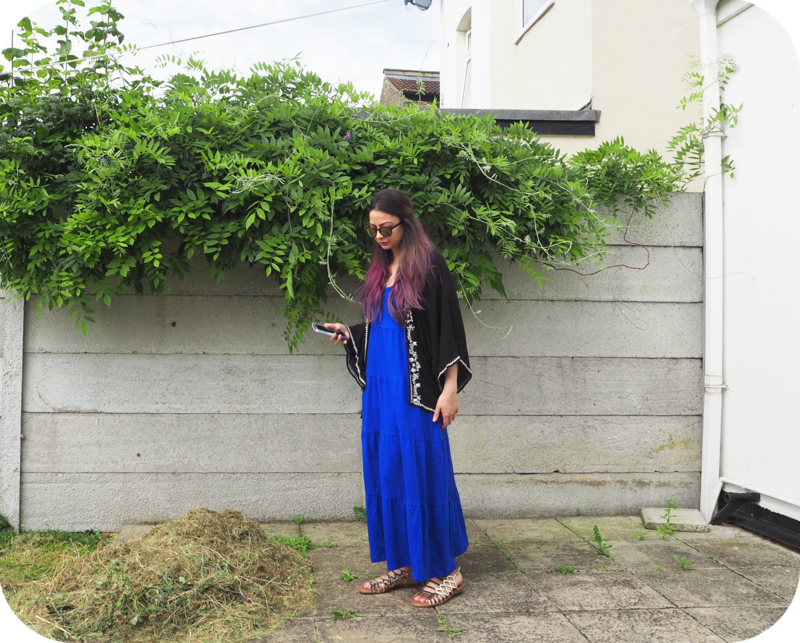 Length – Maxi and midi dresses are amazing for summer. They look extremely flattering on and yes they do actually come in a range of different fits for different body sizes. If you’re very slim, maxi’s in jersey materials look stunning whilst a bias cut maxi will suit absolutely any shape. Wearing extra material doesn’t mean you’re going to feel warmer, in fact a flowy skirt or dress will act as a barrier between you and the sun but still let your pins catch the breeze. Keep it simple – Although both floral and abstract prints can look awesome, sometimes keeping it simple looks even better. Look for little details rather than jsut at the fabric. This stunning Anthology dress has button work down the top and is tiered giving it a different shape and flattering fit. 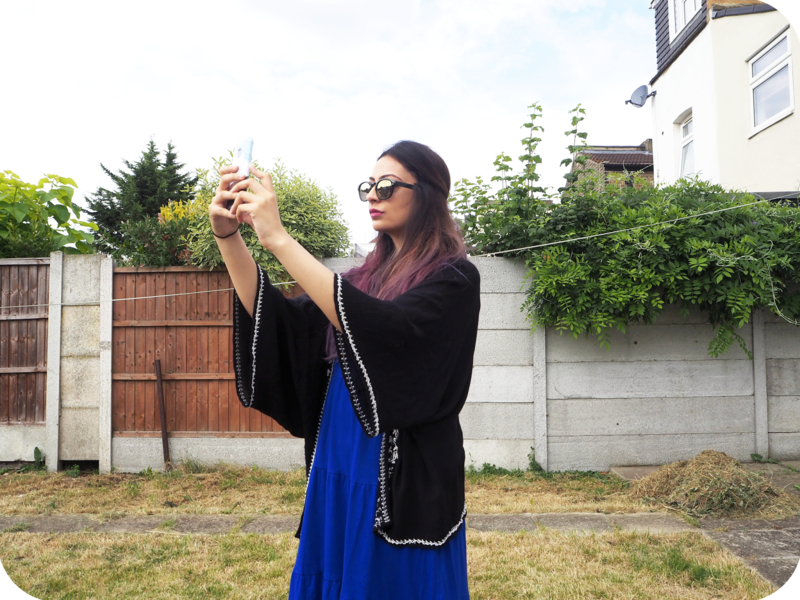 Kimono – The past three years have been brilliant because kimonos made it into high street stores and have made it so much easier to cover up your arms. Sun burn and prickly heat always gets my arms before anywhere else so I try to keep these covered during peak sunshine times where possible. They don’t always have to be covered in sequins and tassles, the simplet ones look just as good. Gladiators – For me, gladiator sandals will never go out of fashion. I have really big wide feet so they do a great job of covering them up whilst not letting them get too sweaty. Plus they’re great for distracting away from my bunions. I’ve styled this dress with a bright light gold pair from Dorothy Perkins. Bold lip – I’m someone who has worn foundation for as long as I can remember but as I’ve gotten older, I’ve eased up on all the heavy makeup. The best way for me to style my face in summer is a good sun lotion with 50SPF and a bold lip. With this outfit I’ve worn Kat Von D’s everlasting lipstick in Mother. If you like the look of my dress and want something similar check out JD Williams’ maxi dress category here. What are your summer styling tips?